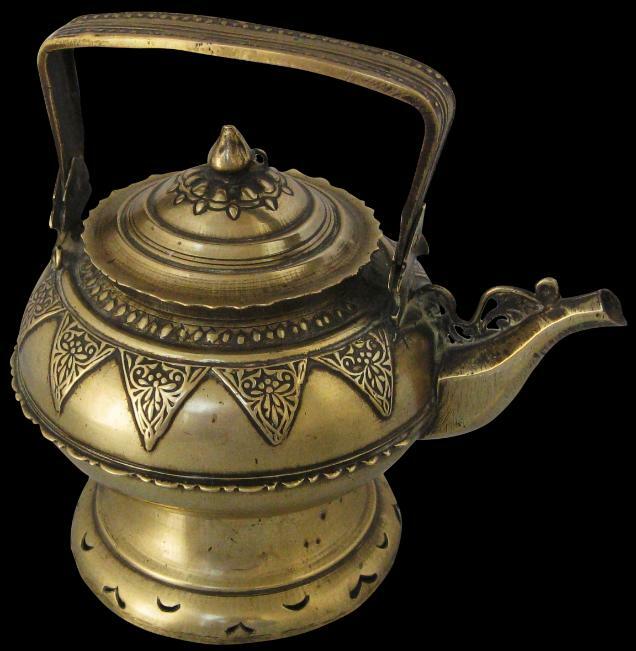 Kettles such as these were used by Malays in Sumatra, Malaysia and Singapore. They were cast by members of the matrilineal Minangkabau ethnic group either in West Sumatra or on the Malaysian peninsular. This example is notable for its small size and delicate proportions; it is among the smallest of such kettles that we have seen. pucuk rebung) motifs, these being identifying characteristics of Malay brassware but which are also commonly used in Malay textile design and woodwork. It has a prominent spout with an open-work scrolling fringe, a cast handle and a cover topped with a lotus-bud finial that sits over, rather than in, the well of the kettle. The rim of the cover and the fringe that runs midway around the globular body of the kettle are scalloped, adding to the elegance of this piece. Malays did not use eating implements but ate with their right hands only. This type of kettle was used not for tea or coffee but to store cold water that was used to wash the right hand after eating. The left hand was used to hold the kettle by the handle and the kettle was then tipped to pour water over the right hand, the water splashing into a basin or onto the ground if eating outside. Alternatively, such kettles were used to store and serve drinking water. In the past, Malays tended to eat sitting on the floor or ground, so the kettle is designed to stand on the floor, and the prominent base permits elevation. 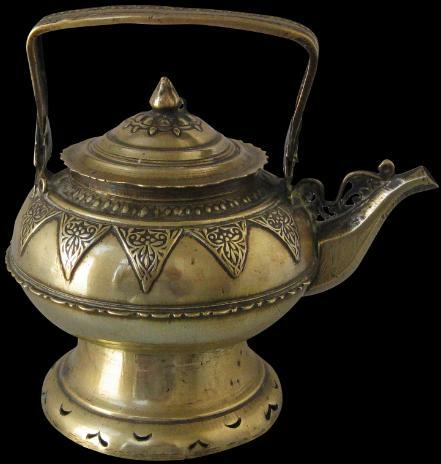 Click here to see the Gallery’s complete collection of Islamic and Indian ewers.